Esther Derby recently ranted about Force Ranking. I’m not an expert on force ranking, or maybe as an independent consultant I am. I’m force ranked every time I work with a client. 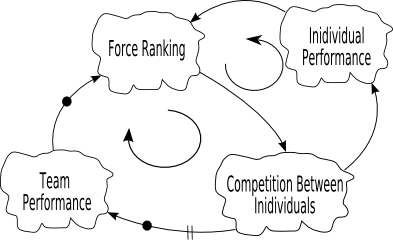 Force ranking creates competition between individuals. As competition increases, more effort will be put into increasing (at least the appearance of) individual performance. As individual performance increases, it appears that force ranking is working, and force ranking gets used more. When this goes on long enough, the people who excelled in being force ranked get promoted and force ranking becomes institutionalized. After all, it worked for them. But after a while, the secondary loop starts to apply pressure to the system. The competition between individuals reduces the team’s performance. This happens since time and energy spent “improving one’s self” comes at the expense of time and energy working toward the team’s goals. It probably creates conflict and tension between the team members, and quite possibly internally in the team members (not everyone enjoys competition). Since the overall team performance has gone down, we need to do more force ranking to get the performance up to where it used to be, there by invoking _Weinberg’s First Law of Bad Management_ If what you’re doing isn’t working, doing more of it won’t help. But It Appears to Work! Force ranking fails to consider (at least) three principle systems concepts: emergence, cause-effect and optimization. 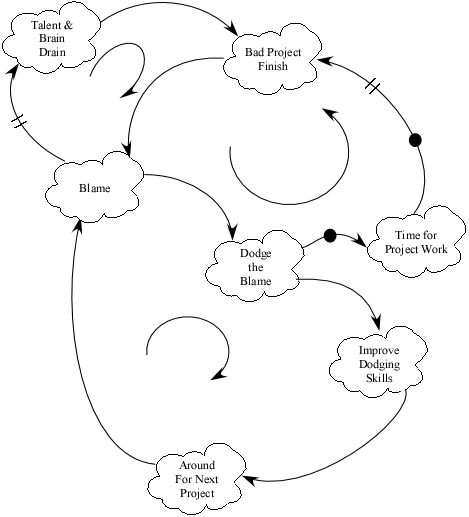 Cause-effect comes into play by separating the effect (poor team performance) from the cause (force ranking) in time. When management notices that team productivity has declined, force ranking will be institutionalized, and the primary thought will be “find the low performers and move them out.” It will take a catastrophic calamity before anyone will stop to consider that force ranking may have caused the problem. Force ranking optimizes the organization at the individual level. As each individual optimizes their outcome, the larger systems (teams, departments, and organization) will be sub-optimized due to the conflicting goals between individuals. If the original reason to force rank is to improve performance, then in the long run, force ranking is dysfunctional as it returns less value to the client than the original state. Without actually saying it, force ranking seems to be a blaming activity. 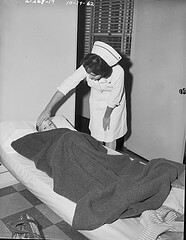 People are identified as “not as good” and removed from the team. Here’s a DoE that shows blaming’s effects. What did I miss? Send me an email.